A ponytail is a style of arranging hair that resembles the tail of a pony. It gets its name from its resemblance to the undocked tail of a horse or pony. A single ponytail is most commonly gathered at the center back of the head or the base of the neck. Depending on fashions, it may also be worn toward one side of the head (over one ear), or on the very top of the head (allowing the hair to fall down the back or one side of the head). 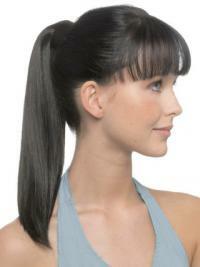 urhair.co.uk offers some types of ponytails such as straight ponytail, balled ponytail and double ponytail. Visit our website and enjoy great discount and fast shipping.